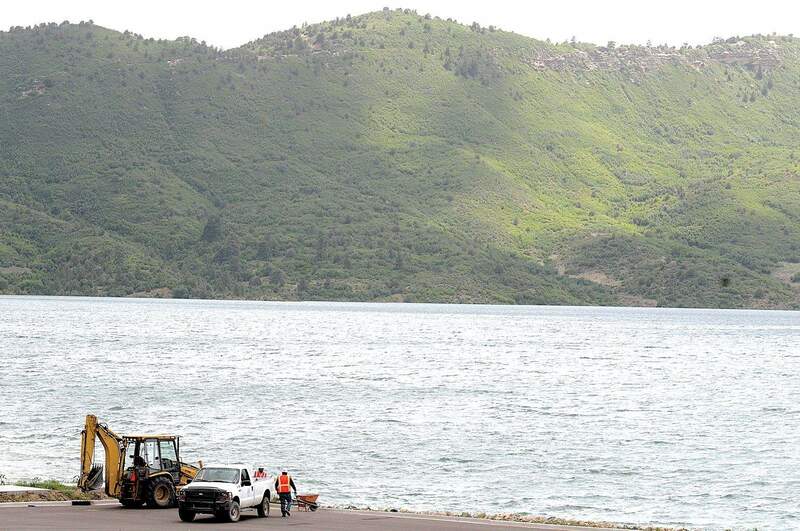 Workers finish the parking lot near the boat ramp at Lake Nighthorse on Thursday. The Bureau of Reclamation has pronounced the reservoir full at 123,541 acre-feet. The reservoir is a key component in the Animas-La Plata Project, which Congress authorized 43 years ago. LAKE NIGHTHORSE  Its full  at long last. Lake Nighthorse, the centerpiece of the Animas-La Plata Project that was created by pumping water from the Animas River, reached capacity at 11 a.m. Wednesday. A-LP, as its known, was authorized by Congress in 1968. In 2003, construction began, and the first water was pumped to the site in Ridges Basin in May 2009. It was generally accepted that Lake Nighthorse, honoring former U.S. Sen. Ben Nighthorse Campbell, R-Colo., had a capacity of 120,000 acre-feet. But the actual capacity is 123,541 acre-feet, Artichoker said. The lake, which has about 1,500 surface acres, will lose an estimated 2,000 to 3,000 acre-feet annually to evaporation. An acre-foot is enough to flood a football field 1 foot deep in water. Monitoring of the project will continue around the clock for 30 days, Artichoker said. Inspectors and instrumentation will be looking at seepage in toe drains on the dam, the dam embankment and the channel downstream. Once Bureau of Reclamation dam-safety officials are satisfied, the project can move to the operations phase, Artichoker said. Lake Nighthorse is off-limits to the public until managed recreation is established. A recreation master plan devised by the Durango-based DHM Design consulting firm through a long public process is being reviewed by the federal agency. The A-LP will provide water for three Native-American tribes, cities and water districts in Colorado and New Mexico. The project was dogged from the inception by politics, frustration among farmers whose claims to water from the project were denied, challenges by environmentalists, uncertain funding from Congress and cost overruns. Total cost of construction was $500 million. Originally, it was slated to cost $338 million.